“Kelvin”, he muttered and then paid them off for their labours. He was sure that Golthar was watching and plotting against their every move. It was a worrying situation. He was pleased to see the group all gathered at the wharf where they all moved in to gather their supplies and rations for the journey to Threshold. Its was close to noon and, after the hearty lunch, Ludo was tired. Facing the unknown of when Golthar would strike next made relaxing impossible. While he waited for the boat to arrive and to start loading, he got out his wetstone and sharpened his sword and daggers, he had a feeling they would be needed soon. “A beautiful bird Lord Hasan. I have never seen its like and I have been by a river most of my life.” Maruc grinned, the beer had put him in a good mood. As he stared at the bird his eyes crossed the sturdy vessel that could only be the passenger boat of which the innkeeper had spoken. The priest waited patiently as the riverboat crew helped the passengers off the boat and handed up their baggage. “Aye lad, how many will be traveling?” he replied. Miklos eyed the bank suspiciously. He half expected to see Jolenta darting between houses in her search for them. Confidently, he perched himself at the prow of the boat and stared, basilisk – like at western shore and surrounding woodland trying with pure force of will to penetrate its shadows and learn its secrets. Feldard kept his eyes on the shore of the river and his grip on his crossbow. It was difficult for even him to tell whether he was more tense because of Jolenta or because of the river they traveled. A few hours into the journey, the boat passed an unsettling sight. The corpse of a female human floated by, killed by three black-feathered arrows. As the sun was setting, Hasan’s keen eyes caught a glimpse of a mounted figure in the distance on the skyline behind them. It was an uneasy night for the companions, but it passed without trouble. They continued to look for signs of the rider who trailed them, and discussed all manner of strategies for the unknown dangers that lay ahead. It was midday when that danger finally found them. Another riverboat emerged from the concealment of a side stream, and moved to cut across the bows of the Mudlark. A group of 10 archers drew black-feathered arrows. Another 8 fighters were poised to attempt to grapple the boats. All the while, a strong looking man in plate armor barked orders to the brigands. Made a mistake in the last post, it takes 2 days to travel by boat. Ludo seeing the foreign riverboat approaching yelled a warning to his companions, grabbed his bow and started shooting arrows at the bowmen. He focused his shooting at the bowmen, trusting in Feldard and Stephen to handle any boarders. As he was shooting his arrows he crouched low in the boat, to give himself as much cover as he could from the side of the boat and presenting himself as a target only when he was ready to release his arrow. 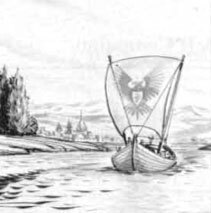 The angry twooo…thud of arrows swiftly brought Miklos below the gunwale. At least this river piracy wasn’t unexpected. First things first, he had to deal with the bowmen. If there was one advantage in boat travel it took a while to do anything, they had time to co-ordinate. “Hasan.” he snapped forgeting his usual honourific, “Can you put those swordsmen to sleep, I’ll take the bowmen.” With a curt gesture and a word of power Miklos engulfed the archers boat with his first sleep incantantion. He ducked back preparing his second spell for the swordsmen. He glanced hopefully at Hasan, the elf should be able to disable the second boat at the same time. Miklos will cast a sleep at the bowmens boat went they get in range. DM: Did Maruc have time during the boat trip prior to the assault to revise any of his cures? If he gets the opportunity before arriving at Threshold Maruc would like to change his spells to CLW CLW Silence & Hold Person. Maruc pulled his shield around and ducked. He edged his way toward Miklos. Should their plan fail at all Miklos would become a target very quickly. He’d need a stout shield. Yes, Maruc got his cures back. Sidebar upated now. The river had begun to lull Stephan and he cursed himself for not being quicker to the bow. The twang of Ludo’s bow was already sounding as Stephan readied his own. He launched two arrows, minding to not send of his enchanted arrows just yet, aiming for the easiest targets at first. He saw at least one of the robbers fall over in an odd way even before his arrow found its mark in the man’s neck. He soon realized it was the good magics of his mates putting those fellows to an untimely sleep. He focused his bowmanship on the large fellow in plate. He’s have to get a lucky shot to get through the armor. Feldard cocked back the bolt in his crossbow and found himself a target. The man in plate armour. His release sounded more like a tocc.. compared to the twang of the bows of the elf and rogue. The dwarf judged distances and reloaded one more time, firing off the second shot as the grapples of those that remained of the brigands flew and landed snagging hold of the Mudlark. Hasan hailed their enemies, “For the Radlebb. For Elyas and the Elyan!” He was somewhat pleased their wait for the hidden rider had ended, and the simplicity of combat was upon them. He joined Miklos in casting a sleep enchantment, focusing his spell’s impact on the swordsman.